If your digital camera came with a USB cable that's too short, or you need to position your USB-connected printer farther away from your PC, a USB2.0 extension cable is the answer. These cables have an A-Male plug on one end (which plugs into an A-Female socket found on the majority of computers and hubs) and an A-Female socket on the other end (which accepts the A-Male plug from your existing cable). 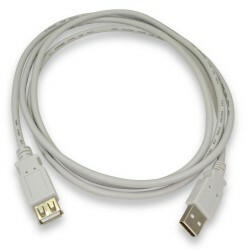 A USB connection should typically not exceed a total length of 20 feet without the use of an active extension cable. These cables are compatible with USB 2.0 standards and backwards compatible with earlier standards.